Medora was founded in 1883 by a 24 year old French nobleman, the Marquis de Mores, who named the town after his bride, Medora van Hoffman. In 1883, Theodore Roosevelt also arrived in the area to hunt buffalo and fell in love with the land, eventually owning two ranches. He credited his time in Medora with enabling him to become President. The small town acts as the gateway to the South Unit of Theodore Roosevelt National Park where visitors can spot wildlife as they drive the 32-mile scenic loop road. A must while in Medora is the Medora Musical with a ‘Pitchfork Steak Fondue’ beforehand. 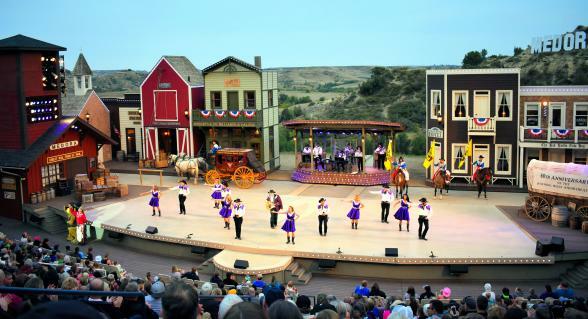 The nightly Broadway-style western show is held throughout the summer months in a natural outdoor amphitheater with breathtaking views of the Badlands as the backdrop. History enthusiasts will have no shortage of attractions to visit while in Medora. Check out the Cowboy Hall of Fame for some western lifestyle, ranch and rodeo history, or the Chateau de Mores to discover what life was like in the late 19th Century.